The Streptococcus pyogenes or Group A Streptococcus (GAS) genome encodes three ABC transporters, namely, FtsABCD, MtsABC, and HtsABC, which share homology with iron transporters. MtsABC and HtsABC are believed to take up ferric (Fe3+) and manganese ions and heme, respectively, while the specificity of FtsABCD is unknown. Recombinant FtsB, the lipoprotein component of FtsABCD, was found to bind Fe3+ ferrichrome in a 1:1 stoichiometry. To investigate whether FtsABCD transports Fe3+ ferrichrome, GAS isogenic strains defective in lipoprotein gene ftsB and permease gene ftsC were generated, and the effects of the mutations on uptake of Fe3+ ferrichrome were examined using radioactive 55Fe3+ ferrichrome. FtsB was produced in the wild-type strain but not in the ftsB mutant, confirming the ftsB inactivation. While wild-type GAS took up 3.6 × 104 Fe3+ ferrichrome molecules per bacterium per min at room temperature, the ftsB and ftsC mutants did not have a detectable rate of Fe3+ ferrichrome uptake. The inactivation of ftsB or ftsC also decreased 55Fe3+ ferrichrome uptake by >90% under growth conditions in the case of limited uptake time. Complementation of the ftsB mutant with a plasmid carrying the ftsB gene restored FtsB production and 55Fe3+ ferrichrome association at higher levels compared with the parent strain. The inactivation of mtsA and htsA and Fe-restricted conditions enhanced the production of FtsB and Fe3+ ferrichrome uptake. The FtsB protein bound Fe3+ ferrichrome, and inactivation of ftsB or ftsC, but not htsA or mtsA, diminished Fe3+ ferrichrome uptake, indicating that FtsABCD, but not HtsABC and MtsABC, is the transporter that takes up Fe3+ ferrichrome in GAS. Fe acquisition systems are virulence factors in many bacterial pathogens and are attractive vaccine candidates. The elucidation of the FtsABCD specificity advances the understanding of Fe acquisition processes in GAS and may help evaluating the GAS Fe acquisition systems as vaccine candidates. Ferric iron (Fe3+), the stable iron form in an oxidative environment, has extremely low solubility in water under physiological conditions, and mammalian hosts thus do not have sufficient free Fe3+ to support bacterial growth . The major sources of iron in vivo for bacteria are host heme-proteins and other iron complexes [1, 2]. Many bacterial pathogens secrete low-molecular-weight iron chelators called siderophores to assimilate iron from host environments . Ferrisiderophores formed are then transported across the cytoplasmic membrane by specific ATP-binding cassette (ABC) type transporters. ABC transporters consist of a solute-binding protein, a membrane protein (permease) encoded by one or two genes, and an ATPase . The solute-binding proteins are located in the periplasmic space in Gram-negative bacteria and are lipoproteins in Gram-positive organisms. Siderophores can be divided into several types based on chemical structures . Ferrichrome  belongs to the hydroxamate type. Streptococcus pyogenes or Group A Streptococcus (GAS) is an important Gram-positive human pathogen causing both invasive and non-invasive infections . Non-invasive infections, including pharyngitis, and post-infection sequelae, such as acute rheumatic fever, rheumatic heart disease, and glomerulonephritis, result in substantial morbidity and economic loss globally. Invasive GAS infections, such as necrotizing fasciitis and streptococcal toxic shock syndrome, are associated with high mortality rates. GAS can take up heme from hemoglobin and haptoglobin-hemoglobin complexes . Exogenously-supplied heme and host heme proteins (hemoglobin, myoglobin, and catalase), but not iron-loaded transferrin and lactoferrin, support in vitro growth of GAS under iron-restricted conditions . Iron acquisition processes in GAS are poorly understood, although progress has recently been made by us [9–11] and other groups [12–14]. GAS genomes [15–17] encode three ABC transporters, namely, HtsABC [9–11] or SiaABC , MtsABC [13, 14], and one encoded by spy0383 to spy0386  (designated FtsABCD), which are homologues of ABC transporters involved in iron acquisition. HtsABC and the cell-surface protein Shp [9–12] are believed to make up the machinery for heme acquisition. The lipoprotein component MtsA of MtsABC binds Fe3+, Zn2+, and Cu2+ , and MtsABC is important for acquisition of Mn2+ and Fe3+ . The transcription of fts ABCD is up-regulated under iron-restricted conditions . 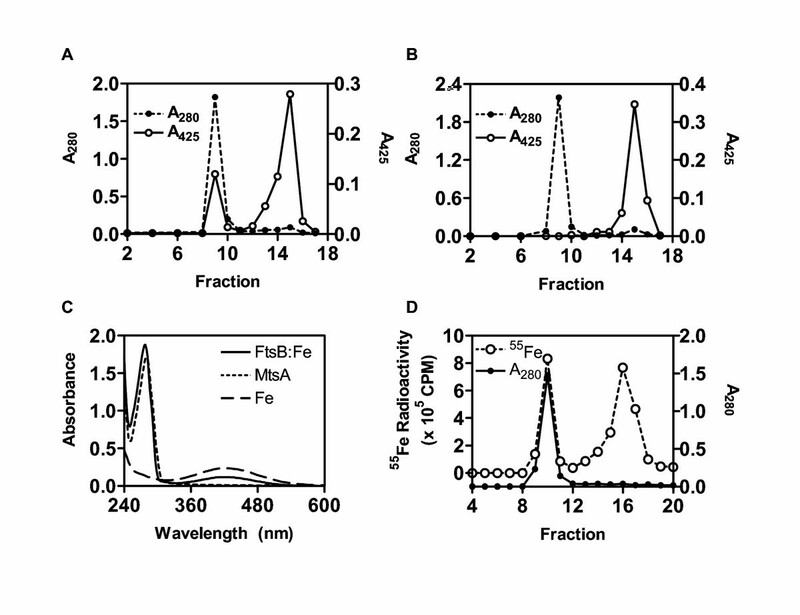 However, recombinant FtsB was heme-free and did not contain Fe, Mn, or Zn . The specificity of FtsABCD is thus not known. It is not known whether GAS can use ferrisiderophores such as ferric ferrichrome (Fe3+ ferrichrome) as an iron source. We found that recombinant FtsB bound Fe3+ ferrichrome, suggesting that FtsABCD is involved in the acquisition of Fe3+ ferrichrome. To test this hypothesis, GAS isogenic strains defective in lipoprotein gene ftsB and permease gene ftsC were generated, and the ftsB and ftsC inactivation dramatically decreased the uptake of Fe3+ ferrichrome, indicating that FtsABCD is the transporter that takes up Fe3+ ferrichrome in GAS. The specificity of an ABC transporter is believed to depend on the binding specificity of its solute binding protein. Purified recombinant FtsB did not contain free metal ions, suggesting that FtsABCD does not target free metal ions . To test whether FtsABCD targets ferrisiderophores, the ability of FtsB to bind Fe3+ ferrichrome was examined by gel filtration. FtsB was incubated with excess Fe3+ ferrichrome and separated from free Fe3+ ferrichrome by chromatography on a Sephadex G-25 column. Fe3+ ferrichrome has an absorption peak at 425 nm and its elution profile was monitored by measuring A425 of each fraction. The elution profile displayed two A425 peaks (Fig. 1A). One co-migrated with the FtsB peak, which was localized by A280, and the other corresponded to free Fe3+ ferrichrome (Fig. 1A). When FtsB was replaced with MtsA in a control experiment, there was only one A425 peak corresponding to free Fe3+ ferrichrome, and no absorbance at 425 nm was associated with the protein peak (Fig. 1B). To check whether the species associated with FtsB was Fe3+ ferrichrome, the absorption spectra of the FtsB and MtsA peaks and free Fe3+ ferrichrome were compared. In addition to the protein absorption peak at A280, the FtsB sample had an absorption peak at 425 nm which was identical to that of free Fe3+ ferrichrome (Fig. 1C). As expected, the MtsA sample only had the protein peak (Fig. 1C). These results indicate that FtsB, but not MtsA, bound Fe3+ ferrichrome. The FtsB sample was found to have 1.08 Fe3+ ferrichrome per FtsB molecule on the basis of protein content and extinction coefficient of Fe3+ ferrichrome at 425 nm, indicating a 1:1 binding stoichiometry. Binding of Fe 3+ ferrichrome to FtsB. (A) Co-migration of Fe3+ ferrichrome with FtsB. FtsB (0.3 ml of 0.18 mM) was incubated with 0.9 mM Fe3+ ferrichrome for 20 min at room temperature, loaded onto a Sephadex G-25 column (1.5 × 18 cm), and eluted with 20 mM Tris-HCl buffer, pH 8.0. Eluant was collected as fractions of 0.7 ml. A280 and A425 of each fraction were used to monitor FtsA and Fe3+ ferrichrome, respectively. (B) MtsA, as a control, did not bind Fe3+ ferrichrome. The experiment was performed under the conditions as those in panel A. (C) The absorption spectra of the protein peaks (fraction 9) in panel A (solid curve) and panel B (short dashed curve) and free Fe3+ ferrichrome (long dashed curve). The three samples contained 46 μM FtsB, 45 μM MtsA, and 100 μM Fe3+ ferrichrome, respectively. (D) Co-migration of partially 55Fe-labeled Fe3+ ferrichrome with FtsB. Fe3+ ferrichrome contained radioactive 55Fe3+ at 1.1% of total Fe3+. A280 and 55Fe3+ radioactivity of each fraction are presented. If FtsB binds Fe3+ ferrichrome, Fe3+ should co-migrate with the protein on the G-25 column. To test this idea, Fe3+ ferrichrome containing 1.1% 55Fe3+ of total Fe3+ was used to repeat the gel filtration experiment, and 55Fe3+ radioactivity was monitored. As expected, one of two 55Fe3+ peaks co-migrated with the FtsB peak, and the other peak corresponded to free Fe3+ ferrichrome (Fig. 1D). On the basis of 55Fe3+ percentage of total iron and specific activity and protein content, the FtsB peak fraction contained 37 μM FtsB and 36 μM Fe, consistent with the 1:1 binding stoichiometry determined above. These results confirmed that FtsB binds Fe3+ ferrichrome in a 1:1 molar ratio. The binding results described above suggest that FtsABCD can acquire Fe3+ ferrichrome. To test this hypothesis, ftsB, ftsC, and mtsA (control) were first inactivated by insertional inactivation (Fig. 2). Inactivation was confirmed by PCR (Fig. 2C) and DNA sequencing. Western blotting analysis detected FtsB (Fig. 2D) and MtsA (Fig. 2E) in the wild-type strain but not in the corresponding mutant strain. These results indicate that ftsB and mtsA were indeed inactivated. The ftsB, ftsC, mtsA, and htsA mutants (construction of the htsA mutant will be described elsewhere) and parent strains were compared in the uptake of 55Fe3+ ferrichrome. Pilot experiments indicated that the wild-type strain could take up 55Fe3+ ferrichrome at both room temperature (24°C) and 37°C. The uptake was thus performed at room temperature for convenience. GAS cells harvested from exponential growth phase were incubated with 0.16 μM 55Fe3+ ferrichrome at room temperature for 1 h, and 55Fe3+ radioactivity associated with bacteria was determined. The ftsB and ftsC inactivation diminished the uptake of Fe3+ ferrichrome (Fig. 3), while the mtsA and htsA inactivation did not abolish but enhanced the uptake. To further examine the uptake of Fe3+ ferrichrome, 55Fe3+ radioactivity taken up by bacteria as a function of incubation time was determined. 55Fe3+ radioactivity with wild-type GAS increased linearly with time up to 30 min with a slope of 153 cpm/min (Fig. 4). The value of the slope could be translated into an uptake rate of 3.6 × 104 Fe3+ ferrichrome molecules per min per wild-type GAS bacterium. In contrast, the ftsB and ftsC mutants did not have a detectable rate of Fe3+ ferrichrome uptake (Fig. 4). The rate of uptake in the mtsA mutant was 2.6 times as that in the parent strain (Fig. 4). These results indicate that FtsABCD, not MtsABC and HtsABC, mediates the uptake of Fe3+ ferrichrome. Insertional inactivation of ftsB , ftsC , and mtsA. (A) Schematic showing the arrangement of ftsABCD genes and their neighbors in the MGAS5005 genome. The ftsA, ftsB, and ftsCD genes encode ATP-binding protein, lipoprotein, and permease, respectively. The numbers above the other arrows are the spy numbers assigned to the corresponding open reading frames in the M1 genome sequence (15). (B) Schematic for insertional gene inactivation. The paired solid or dotted arrows under the mutant genome indicate the locations of primers used to confirm the disruption of the gene using PCR and DNA sequencing. (C) PCR confirmation of insertional inactivation of ftsB, ftsC, and mtsA. The picture shows agarose gel analysis of PCR reactions using mutant (lanes labeled by 1) or wild type (lanes labeled by 2) genomic DNA as template and primers at the locations indicated by the solid arrows under the mutant genome in panel B. (D) Western blot showing the absence of FtsB in the ftsB mutant strain (lane 2) and the presence of FtsB in the wild-type (lane 1) and ftsB/pCMVftsB (lane 3) strains. Proteins from 5 × 108 wild-type cells, 5 × 108 ftsB mutant cells, and 4 × 106 ftsB/pCMVftsB were probed with FtsB-specific mouse antiserum. The amount of ftsB/pCMVftsB cells used was 1/125 of that of the wild-type cells. (E) Western blot showing the presence of MtsA in the wild-type strain (lane1) and the absence of MtsA in the mtsA mutant strain (lane 2). Proteins from 6 × 106 wild-type cells and 3 × 108 mtsA mutant cells were probed with MtsA-specific mouse antiserum. Effects of ftsB , ftsC , mtsA , and htsA inactivation on 55 Fe 3+ ferrichrome uptake. Wild-type and mutant strains were grown to OD600 of 0.4 in 10 ml of THY and THY/spectinomycin, respectively. The bacterial pellets were washed with 1.0 ml of THY and incubated with 0.16 μM 55Fe3+ ferrichrome 1.0 ml of THY at room temperature for 1 h. A triplet of 0.2 ml samples were taken from each mixture, and bacteria were pelleted and washed twice with 0.4 ml of THY. 55Fe3+ radioactivity associated with the bacteria was measured. Presented are the mean values ± SD of 55Fe3+ radioactivity associated with the bacteria in a representative of three experiments. The time course of 55 Fe 3+ ferrichrome uptake for mtsA (open circles), ftsB (open triangles), and ftsC (solid triangles) mutant and wild-type (solid circles) GAS strains. Each strain harvested at the mid-exponential growth phase from 40 ml culture, washed with 10 ml of THY, and incubated with 0.16 μM 55Fe3+ ferrichrome in 4 ml of THY at room temperature. A triplet of 0.2 ml samples were taken from each mixture at the indicated times, and bacteria were immediately pelleted and washed twice with 0.4 ml of THY. Presented are the mean values ± SD of 55Fe3+ radioactivity associated with the bacteria in a representative of three experiments. 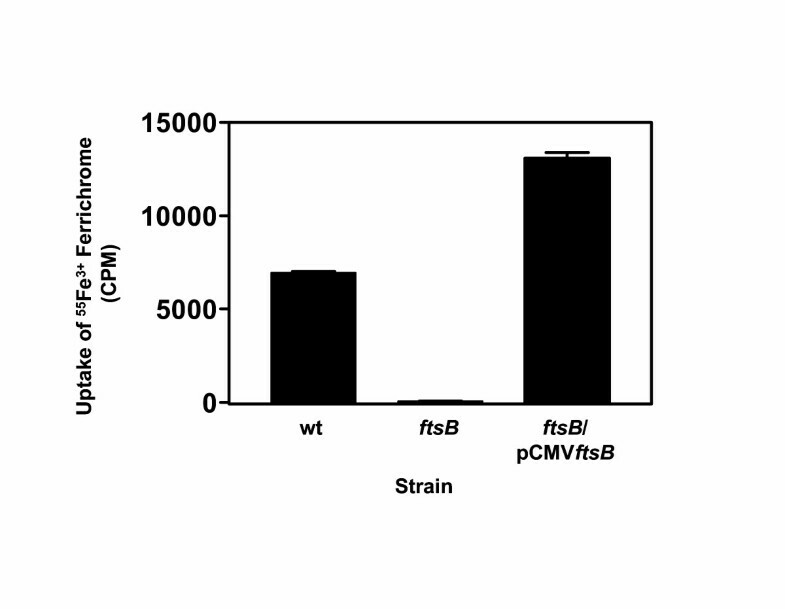 To test whether the effect of the ftsB inactivation on the uptake of Fe3+ ferrichrome was due to the absence of FtsB, a complementing strain,ftsB mutant/ pCMVftsB, was constructed to carry plasmid pCMVftsB with the ftsB gene. The intensity of FtsB band of the complemented strain in Western blotting analysis in Fig. 2D was 7/10 of that of the wild-type strain, and the amount of the complemented strain cells used was 1/125 of that of the wild-type cells, indicating that FtsB was produced in ftsB mutant/ pCMVftsB at a level as 88 times as that in the wild-type strain. Wild-type, ftsB mutant, and ftsB mutant/ pCMVftsB cells harvested in the exponential growth phase were incubated with 0.16 μM 55Fe3+ ferrichrome at 24°C for 1 h, and 55Fe3+ radioactivity associated with the bacteria was determined. 55Fe3+ radioactivity of ftsB mutant/ pCMVftsB was 1.9 and 207 times higher than those of the wild-type and ftsB mutant cells, respectively (Fig. 5), suggesting that in trans expression of ftsB in the ftsB mutant restored the association of Fe3+ ferrichrome. The results support that FtsABCD targets Fe3+ ferrichrome. Complementation of the ftsB mutant. Plasmid pCMVftsB carrying the ftsB gene was introduced into the ftsB mutant strain to obtain ftsB/pCMVftsB. The uptake experiment was performed exactly as in Fig. 3. Presented are the mean values ± SD of 55Fe3+ radioactivity associated with the bacteria. Since FtsABCD is involved in the uptake of Fe3+ ferrichrome, Fe3+ ferrichrome should be an iron source of GAS. This idea was tested by comparing GAS growth curves in THY treated with Chelex 100 to remove metal ions and supplemented with MgCl2 (DTHYMg) in the absence and presence of Fe3+ ferrichrome. The growth curve in the presence of 10 μM Fe3+ ferrichrome shifted to the left by about 40 min compared with that in the absence of Fe3+ ferrichrome under otherwise identical conditions. This small but repeatable stimulatory effect suggests that GAS can use Fe3+ ferrichrome as an iron source. Fe3+ ferrichrome had similar stimulatory effect on the growth of the mutants as that on the growth of the wild type strain, suggesting that either residual uptake of Fe3+ ferrichrome in the ftsB and ftsC mutants were enough to induce the stimulatory effect or an additional process was involved in the uptake of the iron extracted from Fe3+ ferrichrome under the growth conditions. To examine why the stimulatory growth effect of Fe3+ ferrichrome was still observed in the ftsB and ftsC mutants, 55Fe3+ ferrichrome uptake was examined under growth conditions. 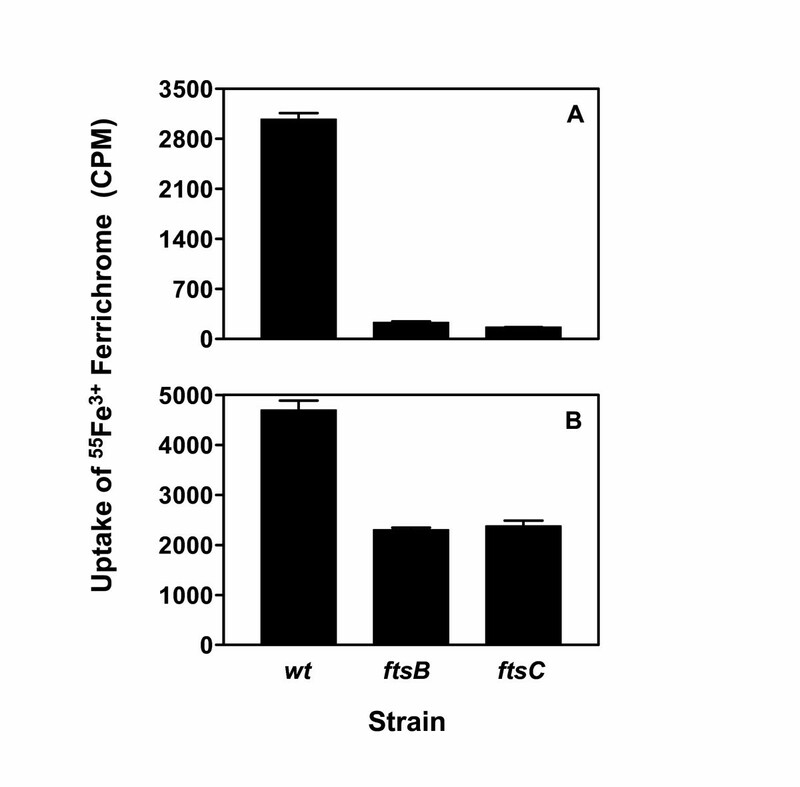 55Fe3+ ferrichrome was added into the cultures of wild-type, ftsB, and ftsC strains at mid-exponential growth phase, and, 30 min later, 55Fe3+ activity associated with bacteria was determined. 55Fe3+ radioactivity of ftsB and ftsC mutant cells were only 7.5% and 5.3% of that of wild-type cells, respectively (Fig. 6A), indicating that the ftsB and ftsC inactivation also dramatically diminished uptake of Fe3+ ferrichrome under growth conditions. However, 55Fe3+ radioactivity of ftsB and ftsC cells grown for 3 h after the addition of 55Fe3+ ferrichrome were about 50% of that of wild-type cells (Fig. 6B). These results suggest that there could be an additional acquisition process which could assimilate 55Fe3+ from its ferrichrome complex. Effects of ftsB and ftsC inactivation on 55 Fe 3+ ferrichrome uptake under growth conditions. (A) Uptake for 30 min. 55Fe3+ ferrichrome (0.16 μM) was added into cultures of the wild-type and mutant strains at 37°C in THY and THY supplemented with spectinomycin, respectively, when OD600 was 0.3. A triplet of 1 ml samples were taken from each culture 30 min later, and bacteria were immediately pelleted and washed twice with 0.4 ml of THY. Presented are the mean values ± SD of 55Fe3+ radioactivity associated with the bacteria. (B) Uptake for 3 h. 55Fe3+ ferrichrome (0.16 μM) was added into the wild-type and mutant cultures at 37°C when OD600 was 0.2, and, 3 h later, the samples were processed as in panel A for determination of 55Fe3+ radioactivity. To further examine the factors to affect Fe3+ ferrichrome uptake, the effects of mtsA and htsA inactivation and Fe-restricted conditions on FtsB production and Fe3+ ferrichrome uptake were investigated. Inactivation of htsA and mtsA increased 55Fe3+ ferrichrome uptake by more than 100% (Fig. 7A). Wild-type, htsA, and htsA mutant cells harvested from THY containing 2,2'-dipyridyl took up 30%–50% more 55Fe3+ ferrichrome than those from THY without 2,2'-dipyridyl (Fig. 7A). 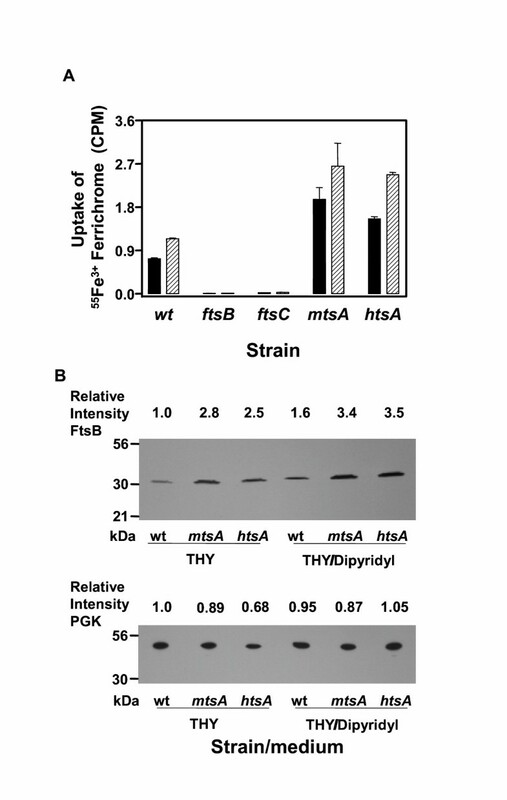 Western blotting analysis indicated higher levels of FtsB in the htsA and mtsA mutants compared with the wild-type strain (Fig. 7B). Higher levels of FtsB were also detected in all strains grown in the presence of 2,2'-dipyridyl compared with those grown in the absence of 2,2'-dipyridyl (Fig. 7B). A control protein, phosphoglycerate kinase (PGK), had similar expression levels under all the conditions (Fig. 7B). The relative intensities of the FtsB bands in the Western blot correlated well with the relative uptake of 55Fe3+ ferrichrome under the same conditions. These results indicate that FtsB production was enhanced in the htsA and mtsB mutants and under Fe-restricted conditions, further supporting the role of FtsABCD in Fe acquisition. Effects of Fe-restricted conditions and mtsA and htsA inactivation on Fe 3+ ferrichrome uptake and FtsB production. (A). 55Fe3+ radioactivity uptake by wild-type (wt), ftsB, ftsC, mtsA, and htsA mutant strains grown in THY in the absence (solid bars) or presence (slashed bars) of 0.3 mM 2,2'-dipyridyl. The experiment was performed as in Fig. 3. (B) Western blots showing the relative levels of FtsB and PGK as a control in the strains grown under the same conditions as in panel A. Proteins from 1 × 108 bacteria of each strain were probed with mouse anti-FtsB and anti-PGK antisera. The relative levels of FtsB and PGK were obtained by dividing the intensity of each band by the intensity of the FtsB or PGK band of the wild-type strain. Evidences from this study indicate that FtsABCD is the transporter that takes up Fe3+ ferrichrome in GAS. The evidences include the binding of Fe3+ ferrichrome to FtsB, the effect of the insertional disruption of ftsB or ftsC on uptake of 55Fe3+ ferrichrome, and the non-involvement of MtsABC and HtsABC in Fe3+ ferrichrome uptake. Complementation data of the ftsB mutant with the ftsB gene expressed in trans indicated that the effect of ftsB inactivation was due to the lack of FtsB. MtsABC [13, 14] and HtsABC [9–12] target free Fe3+ and heme, respectively. The specificity of the FtsABCD transporter elucidated in this study resolved the last piece of the puzzle regarding the roles of ABC transporters in Fe acquisition in GAS. Uptake time was critical to the effects of ftsB and ftsC inactivation on 55Fe3+ activity associated with bacteria under growth conditions. The inactivation had a dramatic effect (>90% decrease in 55Fe3+ activity compared with wild-type strain) when uptake was performed for only 30 min. This decrease was reduced to about 50% when uptake was performed for 3 h. Although the reasons for this reduction are not known, the reduction is unlikely due to the existence of another transporter for Fe3+ ferrichrome. The other uptake results are not consistent with the existence of another Fe3+ ferrichrome transporter. Another possible reason is that 55Fe3+ ferrichrome exchanged its 55Fe3+ with another ferric complex in THY, resulting in a non-ferrichrome 55Fe3+ complex that could be taken up by another transporter. GAS has a putative secreted Fe binding protein (Spy1063). It is not known whether this protein can extract Fe3+ from Fe3+ ferrichrome. The transcription of ftsABCD is up-regulated under Fe-reduced conditions . Consistent with this observation, Fe-restricted conditions enhanced the production of FtsB and uptake of Fe3+ ferrichrome, further supporting the role of FtsABCD in Fe acquisition. 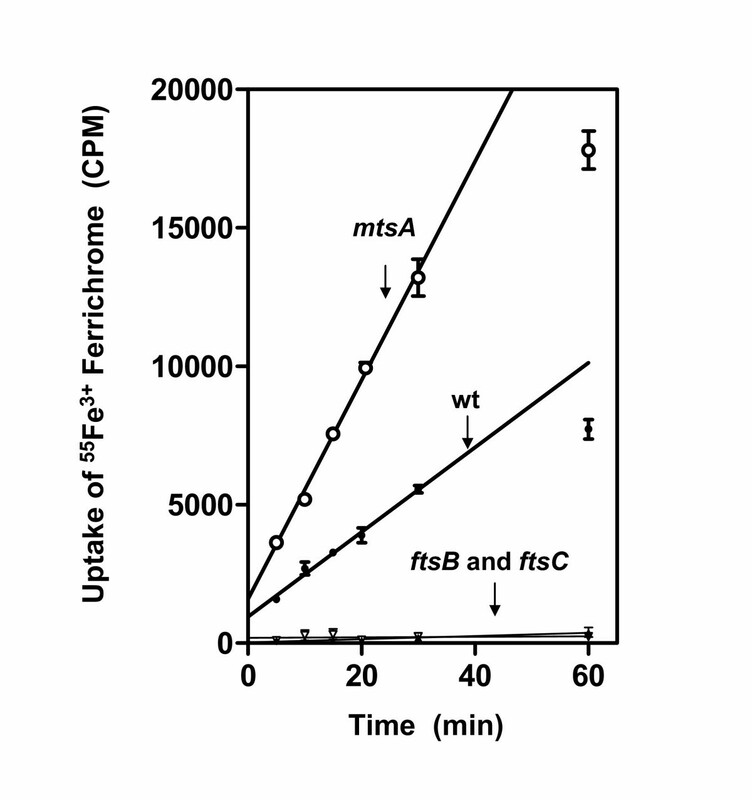 Inactivation of htsA and mtsA also enhanced FtsB production and Fe3+ ferrichrome uptake. Apparently, all the three ABC transporters contributed to Fe3+ acquisition in GAS grown in THY, and inactivation of either mtsA or htsA might result in lower intracellular Fe levels and, in turn, enhanced the expression of ftsABCD. The results also suggest that the expression of ftsABCD, htsABC, and mtsABC is coordinately regulated. Some Enterococcus faecium clinical strains do not produce siderophores but can acquire iron using exogenous siderophores produced by other bacteria living in the same habitats . GAS is not known to produce siderophores, and GAS genomes [15–17] do not have genes encoding homologues of siderphore-production systems. We could not detect siderophore production in GAS under iron-restricted conditions. Therefore, GAS may not produce siderophors. However, GAS takes up Fe3+ ferrichrome, suggesting that GAS could acquire Fe3+ by using siderophores produced by other bacteria in the pharynx and skin, the noninvasive GAS infection sites. Fe acquisition systems are virulence factors in many bacterial pathogens [20–24] and are attractive vaccine targets [25–30]. Elucidation of the specificities of the Fe transporters in GAS will facilitate determination of their relative importance in various infections and choose appropriate animal infection models to evaluate their efficacy as vaccine candidates. For examples, HtsABC could be more important in invasive GAS infection since heme should be the Fe source, and FtsABCD could be important in non-invasive infections because exogenous ferric siderophore complexes should be available. In summary, we found that FtsB bound Fe3+ ferrichrome and that ftsB or ftsC inactivation dramatically decreased Fe3+ ferrichrome uptake. The results indicate that FtsABCD is the transporter that acquires Fe3+ ferrichrome in GAS. Iron chelating agent 2,2'-dipyridyl was obtained from Aldrich. Sephadex G-25, iron-free ferrichrome A from Ustilago sphaerogena, Chelex 100, and other chemicals were purchased from Sigma (St. Louis, MO). 55Fe3+-labeled ferric chloride was purchased from RI Consultants LLC (Hudson, NH). Purified recombinant FtsB (Spy0385) and MtsA were prepared as described previously [10, 31]. Five female outbred CD-1 Swiss mice (4- to 6-week-old) (Charles River Laboratories, Wilmington, MA) were immunized subcutaneously with 50 μg of recombinant FtsB, MtsA, or PGK suspended in 200 μL of saline emulsified in 44 μL of monophosphoryl lipid A-synthetic trehalose dicorynomycolate adjuvant (Corixa, Hamilton, MT). Mice were boosted at weeks 2 and 4. Immune sera were collected 5 days after the second boost. Serotype M1 GAS strain MGAS5005 has been described previously . MGAS5005 and its isogenic mutants were grown routinely at 37°C in 5% CO2 in Todd-Hewitt broth (Difco Laboratories, Detroit, MI) supplemented with 0.2% yeast extract (THY). Spectinomycin (150 mg/L) was added into THY for mutant strains. Iron-restricted conditions were achieved by adding 0.3 mM 2,2'-dipyridyl into THY and by treating THY with the chelating resin Chelex 100 and supplementing it with 0.4 mM MgCl2 (DTHYMg). Tryptose agar with 5% sheep blood (Becton Dickinson, Cockeysville, MD) and THY agar were used as solid media. 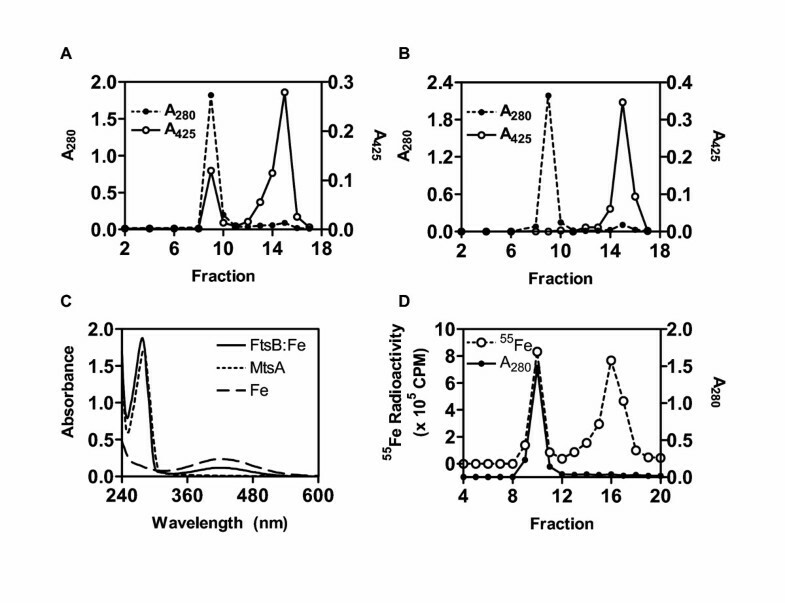 Gel filtration was used to detect the binding of Fe3+ ferrichrome to FtsB. FtsB (0.3 ml of 0.18 mM) was incubated with 0.9 mM Fe3+ ferrichrome for 20 min at room temperature, loaded onto a Sephadex G-25 column (1.5 × 18 cm), and eluted with 20 mM Tris-HCl buffer, pH 8.0. Eluant was collected as fractions of 0.7 ml. The absorbance of each fraction attributable to protein and Fe3+ ferrichrome was measured. MtsA as a negative control was similarly tested for the binding of Fe3+ ferrichrome. The experiment was repeated with Fe3+ ferrichrome in which 1.1% of total Fe3+ was 55Fe, and A280 and 55Fe3+ radioactivity of each fraction were measured. 55Fe3+ radioactivity was measured using a window of 0–6 keV with a Packard 1500 Tri-Carb Liquid Scintillation Analyzer. MGAS5005 isogenic mutants defective in ftsC, ftsB, or mtsA were generated by insertional inactivation (Fig. 2). An internal ~400-bp fragment of each gene was PCR-amplified using MGAS5005 genomic DNA as template and the primers listed in Table 1. The PCR products were digested with Nco I and ligated to pFWaad at the Nco I site to yield suicide plasmids. The orientation of the fragments was determined by DNA sequencing, and the suicide plasmids in which the orientation of the fragments was opposite to that of the aad gene were chosen for generating the mutants. To obtain pFWaad, the spectinomycin-resistant gene aad  was amplified with primers 5'-AGTGTCGACTATAACTAATAACGTAACGTG-3' and 5'-ACCATGGGAATTCTATAATTTTTTTAATCTGTTATTTA-3' and cloned into pFW14  at the Sal I and Nco I restriction sites. Each suicide plasmid was introduced into MGAS5005 by electroporation at 1.8 kV and 400 Ω. One ml of THY was added into the sample immediately after electroporation. The sample was incubated at 37°C for 2 h and plated on THY agar plates supplemented with 150 mg of spectinomycin per liter to select insertional mutants. The plates were incubated in 5% CO2 at 37°C for two days, and the colonies obtained were screened by PCR analysis using the primers listed in Table 1. Gene interruptions were then confirmed by sequencing the PCR products. Fe3+ ferrichrome uptake by GAS was monitored using radioactive 55Fe3+ ferrichrome under non-growth and growth conditions. Under the non-growth conditions, wild-type MGAS5005 and its ftsB, ftsC, or mtsA mutant strains were harvested from the mid-exponential growth phase (OD600 of 0.4) by centrifugation. The bacterial pellets were washed with 10 ml of THY and resuspended in 1 ml of THY. To prepare 55Fe3+ ferrichrome working solution, 4.7 nmole 55FeCl3 was incubated with 14.1 nmole Fe-free ferrichrome A in 50 μL of Tris-HCl for 10 min, and the complex was diluted with 22 ml of THY. The 1-ml bacterial suspensions were mixed with 3 ml of the 55Fe3+ ferrichrome solution (final Fe3+ ferrichrome concentration 0.16 μM) to initiate the uptake process and rotated in a 10-ml tube from end to end at room temperature. A triplet of 0.2 ml samples were taken from each mixture at the indicated times, and bacteria were immediately pelleted and washed twice with 0.4 ml of THY. For uptake under growth conditions, 0.16 μM 55Fe3+ ferrichrome was added into the cultures of wild-type, ftsB, and ftsC strains at early exponential or mid-exponential growth phase. A triplet of 1-ml culture samples were taken at the indicated times after the 55Fe3+ ferrichrome addition and treated as described above. The pellets obtained were resuspended in 0.2 ml of THY and mixed with 3 ml of scintillation liquid. 55Fe3+ radioactivity associated with the bacteria was measured as described above. Production of FtsB or MtsA in wild-type and mutant strains was monitored by Western blotting analysis. To prepare samples for the analysis, bacteria were harvested from cultures at the indicated volumes in exponential phase. The bacterial pellets were washed twice with 1.3 ml of PBS, resuspended in 100 μl of PBS, and treated with 200 units of mutanolysin at 37°C for 2 h. The samples were briefly sonicated and mixed with equal volume of 2x SDS-PAGE loading buffer. Proteins in 10 μl of the samples were resolved by SDS-PAGE and transferred to nitrocellulose membranes. The proteins were detected by Western blotting using specific mouse antiserum as previously described . Chromosomal DNA was isolated with the Puregene DNA Isolation kit (Gentra Systems, Minneapolis, MN). Sequence data were obtained with an ABI 310 automated DNA sequencer (Applied Biosystems, Inc., Foster City, CA). Absorbance and optical spectra were obtained with a SPECTRAmax 384 Plus spectrophotometer (Molecular Devices, Sunnyvale, CA). Protein concentrations were determined with the modified Lowry protein assay kit purchased from Pierce (Rockford, IL) with bovine serum albumin as a standard. Intensities of the bands in Western blotting analysis were determined using an AlphaImager 2000 Documentation & Analysis System (Alpha Innotech Corp.). This work was supported in part by grants P20 RR-16455 and P20 RR-020185 from the National Center for Research Resources, K22AI057347 from National Institutes of Health, and the Montana State University Agricultural Experimental Station. We thank Dr. Kevin McIver for providing plasmid pJRS525. TSH carried out the ferric ferrichrome binding assay and the characterization of the GAS isogenic mutants and participated in writing the Methods section. ML generated the GAS isogenic mutants. 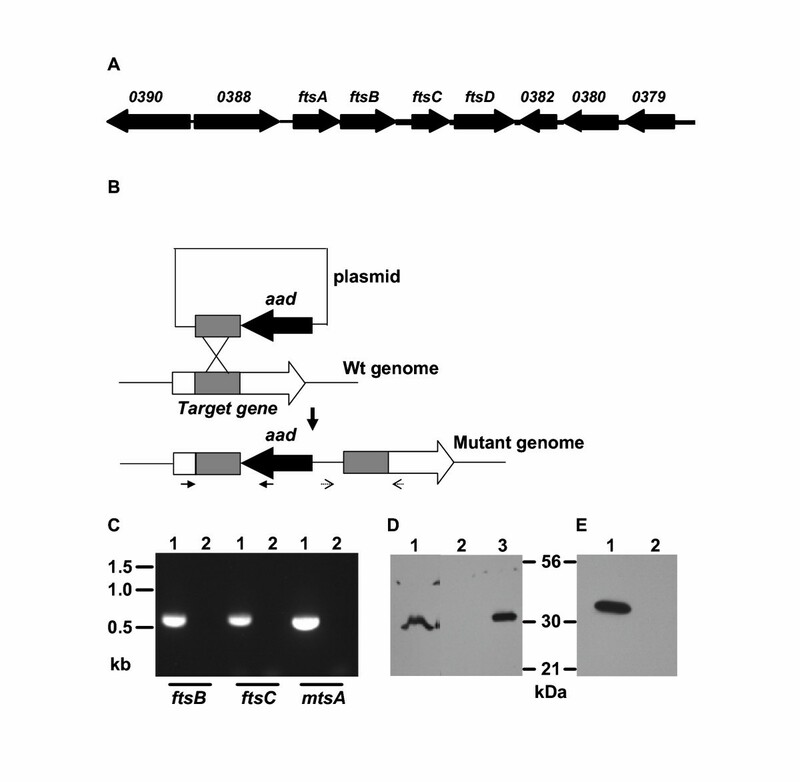 MJM constructed the plasmid for complementing the ftsB mutant. BL designed the study and drafted the manuscript.